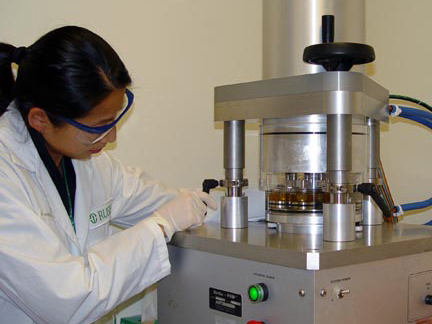 The Tribology Laboratory of the Department of Orthopedic Surgery is focused on understanding the friction, lubrication, and wear of natural and artificial joints. To do this, we use mechanical testing machines that simulate the forces and fluid environment our joints experience as we move. Osteoarthritis is caused by the slow degradation of protective cartilage on articular bone. This chronic disease affects millions of Americans, and in many advanced cases, requires a replacement of the natural with an artificial joint to regain mobility and decrease pain. 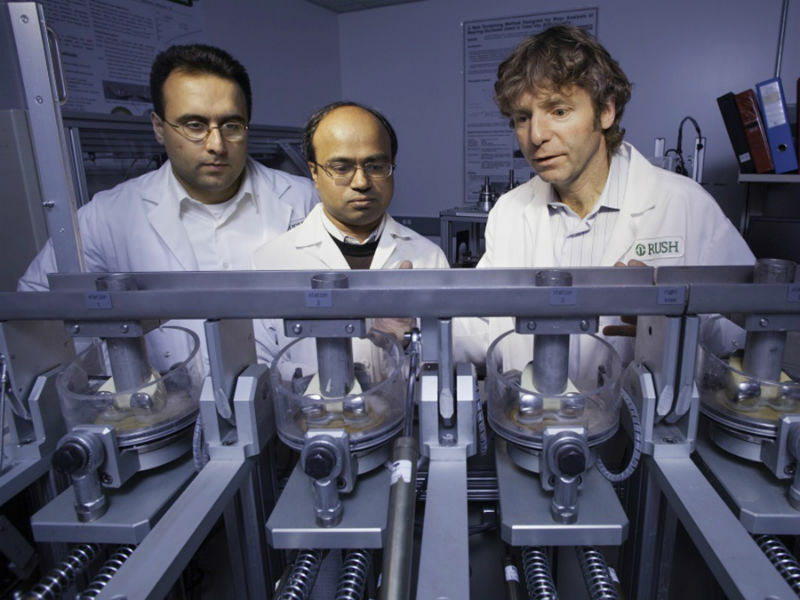 By studying how cartilage reacts when it becomes damaged, and by simulating how artificial joint materials (metals, polymers, ceramics) behave in the body, our researchers seek to gain new insights into the progression of osteoarthritis, and how implant materials can be improved. Ortho-POD pin-on-disc simulator from AMTI, Inc.
Ti-950 nanoindenter from Hysitron, Inc. Flash 250 SmartScope laser coordinate measuring machine from OGP, Inc.
Zahedmanesh, H., Stoddart, M., Lezuo, P., Forkmann, C., Wimmer, M.A., Alini, M., Van Oosterwyck, H. (2014) Deciphering mechanical regulation of chondrogenesis in fibrin-polyurethane composite scaffolds enriched with human mesenchymal stem cells; a dual computational and experimental approach. Tissue Engineering (Part A) 20:1197-212. Lundberg HJ, Wimmer MA. Computational Framework for Determining Patient-Specific Total Knee Arthroplasty Loading, Journal of Medical Devices, 7(4):040904-1, 2013 Dec PMCID: PMC4023849. Lundberg HJ, Knowlton C, Wimmer MA. Fine Tuning Total Knee Replacement Contact Force Prediction Algorithms using Blinded Model Validation. Journal of Biomechanical Engineering, 135(2):021015, 2013 Feb. PMCID: PMC3627216. Lundberg HJ, Foucher KC, Andriacchi TP, Wimmer MA. Direct Comparison of Measured and Calculated Total Knee Replacement Force Envelopes during Walking in the presence of Normal and Abnormal Gait Patterns. Journal of Biomechanics, 45(6):990-996, 2012 Apr. PMCID: PMC3310338. Lundberg HJ, Ngai V, Wimmer MA. Comparison of ISO Standard and Total Knee Replacement Patient Axial Force Profiles during the Stance Phase of Gait. Proceedings of the Institution of Mechanical Engineers, Part H, Journal of Engineering in Medicine, 226(3):227-234, 2012 Mar. PMCID PMC3384520. Our work is made possible by funds from the National Institutes of Health, corporate, and philanthropic research grants and the Department of Orthopedic Surgery. For inquiries, please contact Spencer Fullam.